This page provides you with Chief Technology Officer resume samples that you can use for inspiration in writing your own resume, or for creating one through our easy-to-use resume builder. Below you'll find our how-to section that will guide you through each section of a Chief technology officer resume. Chief Technology Officers like you occupy executive high positions in a business and are responsible for solving the organization's technological and scientific issues. We both know it’s no easy fit, right? We can even add the fact that this is an extremely competitive industry, and boom, we have scared you. Sorry, we didn’t mean to! Don’t worry though, we are here to help you create the best Chief Technology Officer resume ever, thanks to the best CTO resume sample in the web! Employers want to see a resume that speaks to them. CTOs like you require an excellent and standout resume to convince the recruiter that you are the one, even just by one look at your resume. What we can do is to help you create a resume that allows you to get to the next level as a chief technology officer; we will navigate you through the different technicalities involved in writing a good resume. We can help you as we have already inspired over three million customers so far with our professional resume samples! Let us get you the job you have always dreamt of! We can already see you sitting in your future office! 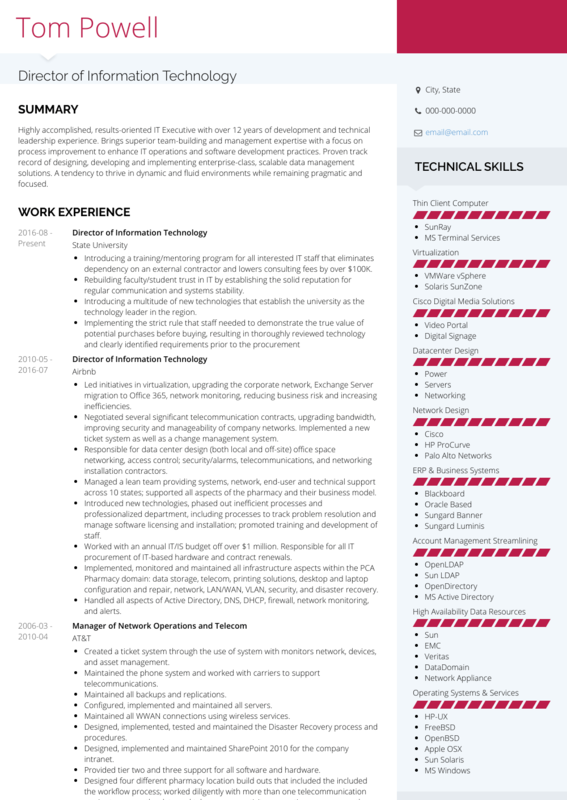 How to Write a Chief Technology Officer Resume? Firstly, as a CTO you’re going to need to have excellent skills in technology and keep yourself constantly updated with the latest technological development which you probably already know. However, you have to try and illuminate these skills in your resume. If you can show you have good people skills and are looking into ways to improve yourself professionally then recruiters might just want to take a second look at you. So, when creating a resume for the position of CTO, you’re going to have to start off by creating a format which makes the resume appealing. You probably think opting for several fonts with several bright colors is a good idea but you’d be wrong. Recruiters aren’t interested in resumes they can’t read or find it difficult understanding, they want simplicity. Finally, watch the type of tone you use. It’s easy to say you’re trying to be funny but it might not come across as funny. What is more, recruiters judge you by how you write and what you write and they might not be impressed with a resume full of jokes. Recruiters want a serious candidate. And don’t forget to save your resume as a .pdf instead of Microsoft Word: you want to keep that layout intact! Resumes without summaries are often put to one side. It shouldn’t be that way but many employers are looking at methods to cut back on potential candidates and sometimes the summaries can do the trick. It’s really simple to create a summary and certainly it’s something you should take a moment to construct. It doesn’t have to be perfect, we know that better than anyone but what we hopefully can help with is creating a summary that answers the question of who you are. A summary isn’t much but it might just be the extra step to unlock an interview. Talk about your past jobs, including a brief job description. Show real results of past achievements. Use lots of positive words and verbs. Use buzzwords – they aren’t needed. Make it all about your social life. Use a foreign language to show your bilingual talents. Employers who reach your work history are usually more impressed by what they have seen so far. That’s actually a good thing for you simply because they have some belief you’re the one they need. However, since they have reached this far, you don’t want to mess it up now. You have to ensure you add a good array of history so that employers can see what you’ve done in the past. What to add on a resume? Firstly, are you employed? If so, you should be adding that onto the resume as it’s your latest job and you potentially have a few references to come from there. However, it doesn’t hurt to list several previous jobs as it brings together a brief work history. A lot of people don’t think about adding work history when applying for a position and yet it’s quite an important factor to consider. Use a neutral but professional tone. Use problem solving skills to show what the employer is getting. DON’Ts (Summarize your relationship history) - Overload information into your work history. - Stuff in a thousand references, one or two should suffice. - Be arrogant in how you describe your past jobs. Need more tips on writing an efficient work experience section for a great CTO? Check out our detailed resume guide. You might not be overly impressed with your own educational background but that doesn’t mean to say you shouldn’t add it to your resume nonetheless. All resumes should have some form of education on them so employers know a little more about your core education. However, you aren’t limited to your time in high school or even junior college. You could actually list a variety of training courses you’ve completed. Any form of education which can be drawn onto your job could potentially be added. Education shows a little more about your training and your background which most employers could find useful. Which institutes you’ve studied at. What subjects you have studied. What the outcomes of your studies were. The amount of information you put into your education section doesn’t have to be overly long, it can be fairly short but effective to appeal to employers. Yes, it’s useful to be thorough in your education but at the same time, you don’t want to drown the employer with lots of information. You need to get a nice balance worked out. One thing which you might not actually be aware of is some employers are screening applicants so they source the most relevant ones. That essentially means you have to use the right skills and talents on your resume. If you don’t put in the skills which employers are looking for, you might not get an interview so it’s best to think about the type of talents or skills you have which employers will find useful. We can help; it’s really a lot less complicated than it appears to be. So, what you want to do is create a small brief of talents and skills which you could use. These skills can be hard skills or soft skills and if you can show the potential employer what you have to offer, you might appeal to them a little more. That’s why skills should be noted down on the resume. Always write a simple cover letter – it attracts employers. Follow our tips here. DO (make yourself look great) - Decide which format you will use. - Look at the technical details you’re adding. - Include your hobbies, even ones that don’t necessarily relate to the job. DON’T (embarrass yourself) - Write two pages of your skills in Microsoft Word or other software programs. - Include internships you were fired from or didn’t complete. - Miss out your education or skill sections. Last but not least, if you are looking for the best Chief Technology Officer resume templates, you should check this masterpiece we have been working on here : many professionals like you have successfully used it to take their career to the next level.